Someone recently asked for a review of the Caiwei A8 HD LED home theater projector because of its $300 price, its "50,000 hour" light engine, and apparently rave customer reviews. And indeed the Amazon listing makes it look terrific. Lots of users are giving it 4 or 5 stars. So we brought one in to take a look. ANSI Lumens. Caiwei claims this projector is rated at 3000 ANSI lumens. Our test unit measured a high of 190 lumens and a low of 170, depending on which of the four operating modes you select. Resolution. 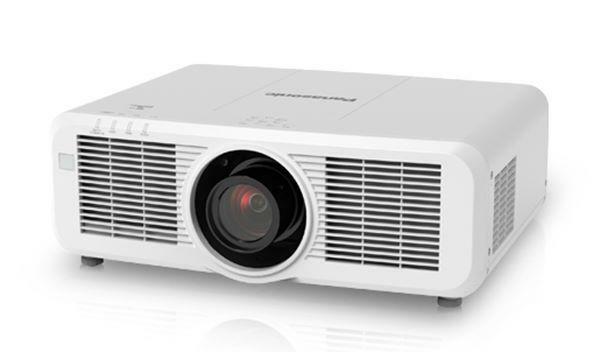 Caiwei promotes this projector as "Full HD 1080p." Once you open it up and look at the specs in the manual, you find that they claim it is really XGA, 1024x768. At the moment, as posted on Amazon the native resolution is also quoted as 1024x768. But the fact is, this projector is not even XGA. It is plain ole VGA (640x480) -- extremely low resolution. It is extremely rare to see a vendor publish an inflated spec on native resolution. With native VGA resolution you get very visible pixel structure and a prominent screen door effect. So you don't get anything remotely resembling "full HD 1080p." The reason they call it "full HD 1080p" in the advertising is because the projector does in fact recognize and display a 1080p signal. They just don't bother to mention that the projector compresses that HD 1080p signal down to very low resolution by the time it gets to the screen. Brightness uniformity. Our unit measures 60% uniformity, which is poor for a video projector. The screen image is visibly uneven, brighter in the middle, with obvious vignetting on all four corners. Color uniformity. Very poor, with the picture appearing cooler in the middle and falling off to warm in the corners. A blue sky across the screen is blue in the middle and biases toward green-yellowish in the corners. Sharpness. The picture is reasonably sharp in the middle but blurs out toward the sides due to the cheap lens. There is clear pixel structure in the center, while toward the sides of the image the pixel structure is blurred out. In addition to the optical limitations, the three preprogrammed operating modes, Dynamic, Standard, and Mild, all overdrive edge enhancement significantly, and there is no way to turn it off. However, if you happen to own one of these things, you can select User mode and take the Sharpness control down from its default of 60 to about 20, where the picture looks quite a bit more natural. Overscan. The Caiwei A8 loses 4% of the picture signal on the edges due to overscan. If there is a way to eliminate the overscan, it is not obvious from the menu or remote options. Input lag. Actually, this is one of the few reasonably good measurements -- it clocks in with a 28 ms input lag, which is a bit faster than most of the inexpensive DLP projectors out there these days. Fan noise. The published noise rating is 35 dB, and this spec is accurate. The noise is quite apparent and louder than most inexpensive home theater models, but not so loud as to be outrageous. If you can live with the poor picture quality, you could certainly get used to the fan noise. Stuck pixels. Stuck pixels are a rarity on the LCD projectors made by the major vendors these days, but we have five stuck pixels on this particular unit. And they are obvious due to the low VGA resolution. 50,000 Hour LED Light Engine. Whether this projector would actually last anywhere near the 50,000 hours claimed by Caiwei nobody knows. What we do know is that the already dim picture is likely to get dimmer rather quickly, if the performance of cheap LEDs in other products is any indicator. In response to our notice to Caiwei that the A8's native resolution is being misrepresented, a Caiwei rep said the XGA resolution was an inadvertent error in the Amazon listing that had been corrected, but somehow reappeared on Amazon. She was surprised to hear that the same error exists in the specifications published in the A8 Owner's Manual. As far as lumen ratings are concerned, a spec of 3000 lumens vs. actual performance of 190 lumens is a gross error similar in magnitude to the overinflated numbers we've seen on other small Chinese brands being sold on Amazon. One is tempted to say that you get what you pay for. But in this case, that's not true. For about $300 you can get either the Caiwei A8, or a far superior home video projector from the more established projector manufacturers. As an example, the Epson Home Cinema 640 (currently $329), is substantially brighter, higher in contrast, and has much quieter fan noise in eco-mode. And even in eco-mode, the Epson HC 640 is many times brighter than the Caiwei A8. Moreover, the Epson HC 640 is higher in native resolution -- it is SVGA, which is 800x600 compared to the 640x480 on the Caiwei A8. Color balance and uniformity is much better on the Epson, as is brightness uniformity. You won't get stuck pixels, and you'll get an Epson two-year warranty which is worth a lot more in peace of mind than a one-year warranty from Caiwei. Bottom line: Don't be taken in by the glowing Caiwei A8 customer reviews on Amazon. Some of those reviews may have been placed there by the vendor, and some may have been written by novice buyers who simply have no prior experience with projectors and are easily impressed. But the fact is, for about three hundred bucks you can do a LOT better than the Caiwei A8. Thank you for exposing the problems with these cheap ripoffs. 5 years ago, I sprung the extra 50 to get a Benq MS510 over a 'Brand X' projector. It's an 800x600 projector and has a bunch of other limitations. But (by direct comparison with some friends cheap projectors), it absolutely knocks their socks off in terms of brightness, colour saturation, clarity. To the degree that I am repeatedly asked to confirm that it is 'just' an 800x600 projector. I'm projecting onto a white wall at ~120" diagonal. It will shortly be replaced with a W1070+ but has given me many years of good service. You do a great service in exposing the scam of the cheap projector. The projector itself has no flaws...it is just an accurate representation of the crippled, soulless people involved with its creation and sale. yes so true ! here in India we face similar problem from Lucem and boasts of similar specs on Amazon.in. its hard to convince a customer who is fancied by the features listed ! Thank you for confirming what i found out through buying this junk, got this as a second projector last year, used in once at a scouting event last year, never used it again. Was going to sell it on but would not like to rip any one off. Fit for the bin no where else. Is this 3LCD or DLP? Danco, it is neither 3LCD or DLP. It uses one large low resolution LCD panel. You guys are spot on. I got this junk from amazon the other day and was very disapointed. Amzon should not be allowed to do this but they do. Thanks for the review. Very enlightening. Returning the unit today! I concur with the review. I used this projector for the past three years and honestly, it wasn't terrible. I hadn't researched it well-enough and didn't have a benchmark for comparison. It occurred to me over time that it wasn't that bright. When there was ambient light, I would turn the contrast up, which led to outside shots in TV shows looking white, rather than seeing buildings etc in the shots. Recently, the projector started to go dimmer. I guess it lasted about 2000-2500 hours before it started doing that. So that motivated me to finally buy a better one. After much research this time, I ended up buying the Optoma HD144X FULL HD Home Theatre & Gaming Projector, for $1399. It not only claims to be 3200 ANSI lumens, it really is. I can see the display clearly even in the daytime. The focus is way better and of course, it has the Keystone adjustment feature, which the Caiwei did not. So if the projector is tilted slightly up or down, you can adjust the sides so it looks right. Conclusion: it was worth spending the extra thousand dollars to get something decent.